Artist & graphic designer based in Skåne. Even as a one man operation I am aware - in both private and company aspects - of the impact I have on the environment. 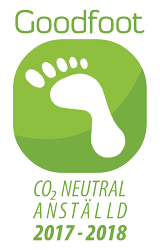 Good foot has helped me acheived my CO2 neutrality goal in a perfect manner.